With assets worth more than Rs 76 crore, Deputy CM Sukhbir Singh Badal today turned out to be the richest candidate in the fray among those who have filed their nominations till now for the January 30 Assembly elections. Sukhbir filed his papers from the Jalalabad Assembly segment. He has gone richer by Rs 17.77 crore in the past two years. Sukhbir�s assets were worth Rs 58.67 crore during 2010 byelections. 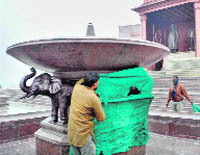 A Public Interest Litigation challenging Election Commission's order to cover statues of the elephant � the ruling BSP's poll symbol � was today filed in the Allahabad High Court as authorities took up the onerous task of draping scores of such statues in Lucknow and elsewhere in the state. Team Anna has decided not to target any political party on the issue of the Lokpal Bill, at least for now. Cold wave continued to wreak havoc in the North with the region recording below normal day and night temperatures with dense fog disrupting road, train and flight operations. 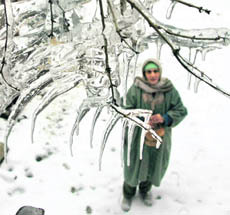 As rain and snowfall aggravated miseries of the common man, reports claim the severe cold has claimed the lives of around 140 persons during this season so far. Claiming Gujarat to be a power surplus state with guaranteed 24 hours seven days a week power supply, self sufficient in water, recording 10 to 11 per cent growth in agriculture for the past one decade and exporting milk, vegetables and Pujaris (religious priests) to many countries, Chief Minister Narendra Modi not only had his address repeatedly punctuated with applause from a packed auditorium but also got a standing ovation at the chief ministers' conclave on the third and final day of the 10th Pravasi Bharatiya Divas here today. Nearly seven years after the Maharashtra Government banned dance bars across the state, the business continues to flourish, often with the help of corrupt police officials. 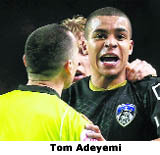 Two weeks after Indian student Anuj Bidve was shot dead in a Manchester suburb, the verbal abuse of a black soccer player has served as an unpleasant reminder of the racism that rears its head from time to time in British society.